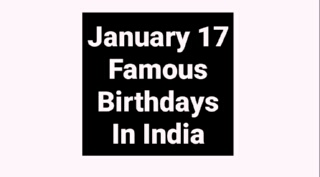 In this post you will know -- Famous Birthdays January 17 Bollywood Actor Actress Cricket Politics, check who are sharing your birthday in India -- 17 January's famous birthday personality in India like Bollywood actor, actress, cricketer, politician and all famous Indian celebrity Stars. Javed Akhtar (born 17 January 1945) is a poet, lyricist and scriptwriter from India. Akhtar is a main stream writer and some of his most successful work was carried out in the late 1970s and 1980s with Salim Khan as half of the script-writing duo credited as Salim-Javed. Akhtar continues to be a prominent figure in Bollywood and is one of the most popular and sought-after lyricists. Bindu (born 17 January 1951) is an actress in Indian cinema who was most popular, receiving several award nominations, in the 1970s. She has acted in over 160 movies in a career that spanned four decades. Bindu was born to film producer Nanubhai Desai and his wife Jyotsna at a small village called Hanuman Bhagda in the district of Valsad in the Western Indian state of Gujarat. Karan Kapoor, Indian actor and model of the 1980s, is a member of the famous Kapoor family, an influential film dynasty in India's Bollywood cinema. He was born on January 17, 1962. He is the son of the famous actor Shashi Kapoor and actress Jennifer Kendal. He started his film career in his father's films and later in other films as the lead. His first mainstream Bollywood film was Sultanat. Honey Irani is an award-winning Indian screenwriter. Honey Irani was born into a Zoroastrian family on January 17, 1950. She was married to Javed Akhtar. Although the marriage ended in divorce, it produced two children, son Farhan Akhtar and daughter Zoya Akhtar. Both her children are critically acclaimed Indian filmmakers. She is the maternal aunt of choreographer/director Farah Khan and director. Tapasvi Mehta is an Indian actor and musician who made his debut in the Disney Channel India show, Ishaan. Mehta started his acting career at the age of 12. His first role was in the Disney Channel India show, Ishaan. Mehta played the main character, Ishaan. His most recent role is as Rocky Ahluwalia in the Sony TV drama, Parvarrish - Kuchh Khattee Kuchh Meethi. Syed Amir Haider Kamal Naqvi popularly known as Kamal Amrohi or Amrohvi in Urdu (17 January 1918 - 11 February 1993) was an Indian film director, screenwriter, and dialogue writer. He was a Shi'a Muslim and an Urdu and Hindi poet. He is famous for his Hindi films such as Mahal (1949), Pakeezah (1972) and Razia Sultan (1983). He established Kamal Pictures (Mahal Films) in 1953 and Kamalistan Studio. Asghar Khan (January 1921) is a Pakistani veteran aviation historian, peace activist, and retired military figure— a three star rank air marshal— who served as the first native Air Force Commander-in-Chief of Pakistan Air Force from 1957 until resigning in 1965 prior to the start of the air operations of PAF during Indo-Pakistani War of 1965. Akkineni Lakshmi Vara Prasada Rao (17 January 1908 – 22 June 1994), known popularly as L. V. Prasad was an Indian film producer, actor, director, cinematographer and businessman. He was one of the pioneers of Indian cinema and is the recipient of the Dadasaheb Phalke Award, the highest Award for films in India. The Prasad Studios, Prasads IMAX and L V Prasad. Dattaraya Ramchandra Kaprekar (1905–1986) was an Indian mathematician who discovered several results in number theory, including a class of numbers and a constant named after him. Despite having no formal postgraduate training and working as a schoolteacher, he published extensively and became well known in recreational mathematics circles. Kaprekar received his secondary school education in Thane. Maharajadhiraj Sir Yadavindra Singh Mahendra Bahadur, GCIE, GBE January 17, 1913, Patiala, Punjab – June 17, 1974, The Hague, Netherlands) was Maharaja of Patiala from 1938 to 1974. Moreover, he was an Indian cricketer who played in one Test in 1934. Maharaja Yadavindra attended Aitchison College, Lahore. Russi Mody (born 17 January 1918) was former Chairman and Managing Director of Tata Steel and a leading member of the Tata Group. Russi was born 17 Jan 1918, in Mumbai to a Parsi family. His father was Sir Homi Mody. His mother was Lady Jerbai Mody née Dubash. Russi has two brothers, Kali Homi Mody and Piloo Mody. After a few years of schooling in India, he was sent to England for further studies. M. G. Sasi (born 17 January 1967) is a film and drama director from Kerala. His short film Kanavumalayilekku received National Film Award for Best Educational Film in 2002. His first feature film Atayalangal (2008) received the Kerala State Film Awards for Best Film and Best Direction in 2007. Babu Gulabrai (January 17, 1888 – April 13, 1963) (pen name: Gulabrai MA) was one of the greatest literary figures of modern Hindi literature. Babu Gulabrai was born in Etawah, where his father, Babu Bhawani Prasad, was a munsarif in the judicial court. His father was an extremely honest and upright man while his mother 'Smt. Gomati Devi' was an extremely religious woman. Rangeya Raghav (17 January 1923 – 12 September 1962), birth name Tirumalla Nambakkam Viraraghava Acharya, was born in Agra, a city of Uttar Pradesh state, India. A prominent Hindi writer of the 20th century, he completed his post-graduation studies from St. John's College, Agra, and later completed his Ph.D. on Guru Gorakhnath. He started writing at the age of 13 years. Shakuntalā Parānjpye (17 January 1906 – 3 May 2000) was an Indian writer and a prominent social worker. She was a member of Maharashtra Legislative Council during 1958–64, and was a nominated member of Indian Rajya Sabha (Upper House of Parliament) during 1964–70 . In 1991, the Government of India awarded her the Padma Bhushan title in recognition of her pioneering work in the field of family planing. Antony Ronald Legard (17 January 1912–22 August 2004), nicknamed Loopy, was an Indian-born English cricketer who played 36 first-class matches, mostly for Oxford University in the 1930s. He also played twice for Free Foresters and had one match each for Worcestershire, the Europeans in India and MCC. Legard made his first-class debut for Oxford against Leicestershire at The University Parks in May. Evangelist Shyju Mathew, founder president of Shyju Mathew Ministries was born on 17 January 1986, in the southern state of Kerala in India. Soon after his birth his parents moved to Bangalore, Karnataka when he was just six months old. He spent his childhood growing up in the city of Bangalore, Karnataka. He is invited to many Christian Evangelical and Prophetic conferences internationally. Sir Malcolm Nicholson Hogg (17 January 1883–February 1948) was an English banker and a member of the Council of India from 1920 to 1925. Hogg was the youngest child of the prominent London merchant Quintin Hogg. He was educated at Eton College and Balliol College, Oxford and then joined the bankers Forbes, Forbes, Campbell & Co in 1904, going out to their Bombay office the following year and later. Nicknamed ‘The Greatest’, Muhammad Ali was one of the legends in the sport of Careeral boxing. At 6 feet 3 inches, he was an imposing figure in the ring, known for his swift footwork, and powerful jab.